This notification is done with a form called “Demand for Possession” or “Notice to Quit”. The form may be purchased at the District Court for $1.00 The Landlord must then serve the Renter with this notice. This may be done by mailing the notice to the Renter by First Class Mail, handing the notice to the Renter personally, or by certified mail. The Landlord must then give the Renter 7 days to pay the rent before initiating a lawsuit with the Court. If the Landlord wishes to have the Renter evicted regardless of the rent status, the Landlord must first notify the Renter of the Landlord’s intent with a form called “Notice to Quit – Terminate Tenancy”. The Landlord must then serve the Renter with this notice. This may be done by mailing the notice to the Renter, First Class Mail, handing the notice to the Renter personally, or by certified mail. The Landlord must then give the Renter 30 days to vacate the premises voluntarily before initiating a lawsuit with the Court. 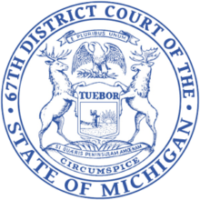 The Michigan legislation requires District Courts to collect an “Electronic filing system fee” in addition to the existing filing fees when commencing a civil action in the District Court, regardless of whether the action is filed electronically. *If the Landlord is seeking Supplemental Damages, (such damages may include but is not limited to: back rent, unpaid bills or damages to the premises) an additional filing is then required. The fee is based upon the amount of the damages being requested. Once the Summons and Complaint have been delivered to the Court along with the required items listed above, and the filing fee has been collected, the Court Clerk will assign the matter a case number and a court date. The court date, as required by law, will be between 7 and 10 days from the date that the Summons and Complaint were filed. After the Court hearing, should the Renter fail to move out as ordered by the Judge, the Landlord/Plaintiff, must file with the Court a form called “Writ of Restitution” or “Order of Eviction”. There is a filing fee of $15.00 when this form is filed with the Court and also requires the Judge’s signature.